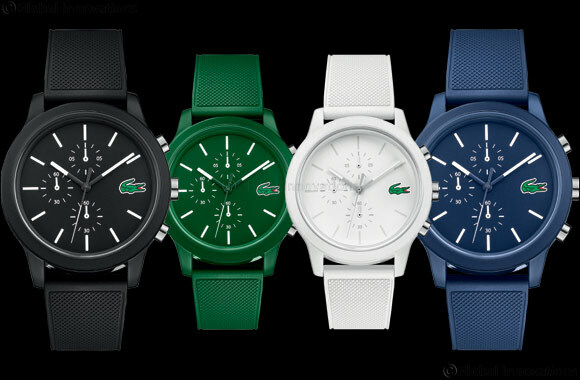 Dubai, UAE, September 17, 2018: LACOSTE revisits its classics and offers a new version of its iconic LACOSTE.12.12 watch. The collection is available in a three-hands or chronograph version. True to the brand’s DNA and inspired by the iconic polo shirt, these two new models show time elegantly by opting for sporty lines and timeless colors such as blue, green, black or white. Soberness and simplicity predominate the design of these two new versions thanks to a modern monochrome look and the qualities of a nylon-infused resin (TR90) case. The LACOSTE.12.12 collection, recognisable by its green crocodile positioned at 3 o’clock, is also distinguished by two discrete new markings:a stylised polo shirt on a petit piqu� background on the back of the case and a LACOSTE.12.12 marking on the end of the strap.